Perhaps the greatest thing that’s happened to me this month is that Trader Joe’s started selling rainbow carrots for $1 a pound. This beats the absurd amount of money I was forking over at my local specialty store just for cosmetic purposes. 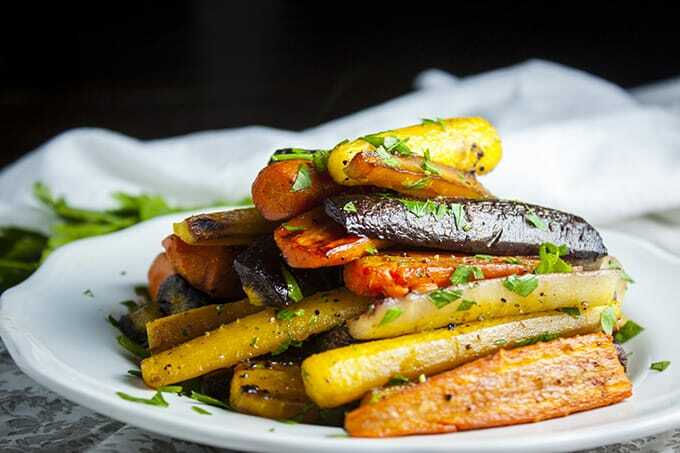 Unlike grapes, say, carrots taste the same regardless of color which means this recipe is just as delicious even with plain ol’ orange carrots. But it sure is pretty with a variety of colors. This technique was stolen from Cook’s Illustrated and really does result in the best roasted carrots I’ve had. These tender, sweet batons are a delicious, low effort side dish – just throw them in the oven while preparing the rest of your meal. Easy enough for weeknights but dead fancy for entertaining, they’re also great for simply snacking. Comforting and homey for the cooler seasons, this recipe is paleo, vegetarian, gluten-free, and can be easily made vegan. 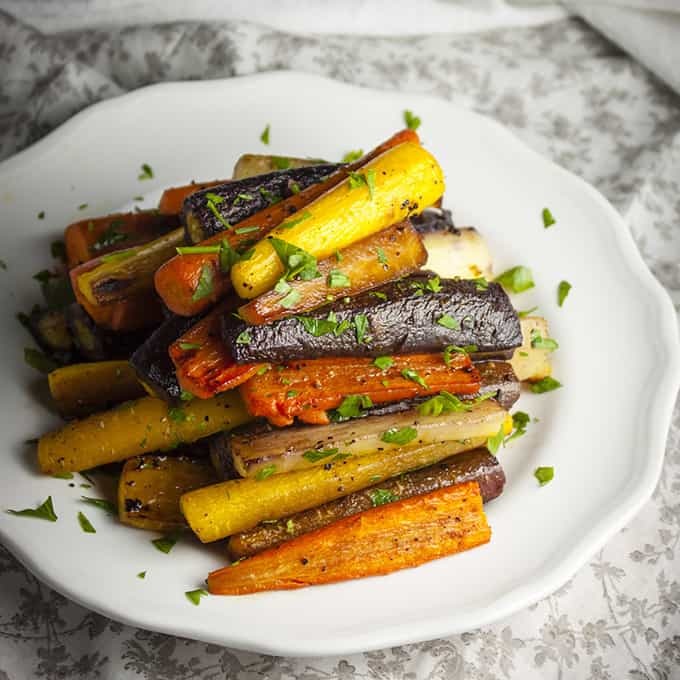 I love these carrots with fresh thyme and parsley but any other herb (chives, tarragon, rosemary) or even no herb would work. 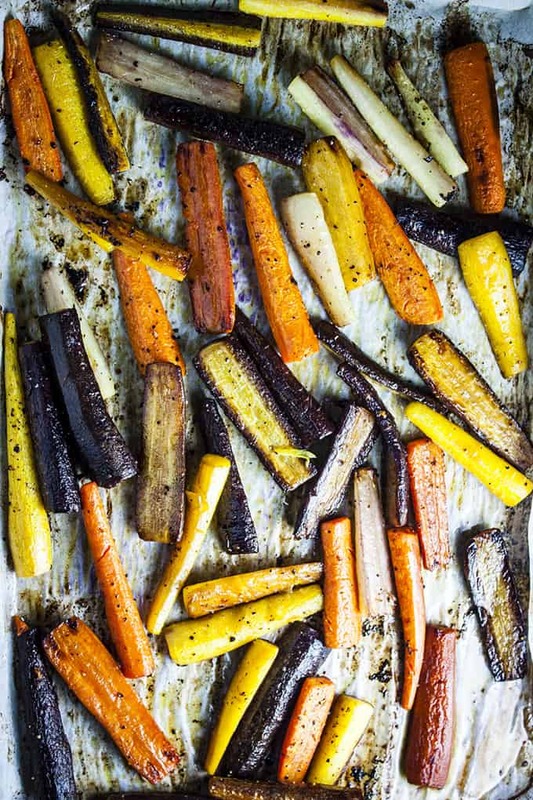 Line a baking sheet with parchment paper and arrange carrot sticks in a single layer. Drizzle carrots with olive oil and melted butter. Season with salt and pepper and and toss to evenly coat. Cover the pan in foil and seal the sides. Bake for 15 minutes and remove the foil. Continue to bake, uncovered, until the carrots are beginning to brown, about 30-35 minutes, stirring every 10 minutes or so. Toss with fresh herbs, adjust seasoning, and serve. Thanks, Vanessa! I’m so happy to discover your blog. http://www.veganfamilyrecipes.com looks fantastic!